Clothing is an essential companion of any human. It is also our most distinguishing feature, if we talk only about our appearance. However, it is not surprising. Animals often do not leave their area which is designed for them by nature, and do not need any additional insulation. Any human being is very curious, it needs to stick his nose everywhere, examining all corners of the globe, so sometimes we have to put on some extra "skin" to keep warm. Over time, the representatives of our species have "hooked" so firmly that now you can not even imagine humanity without any clothing. Fabrics which are made with the help of plants became our huge help. Linen, cotton, cannabis fabrics ... Modern people are completely covered with synthetics as then only natural materials quoted. However, the people who lived in that time had no alternatives, therefore they made automatically their right choice. As "natural product" interacts much better with body than synthetic ... hm, pleasures. However, we are not going to talk about all kinds of natural materials at the same time, but only of cannabis fabric and its application in the course of human history and its application today. This material stands out from others, due to its significant advantages. 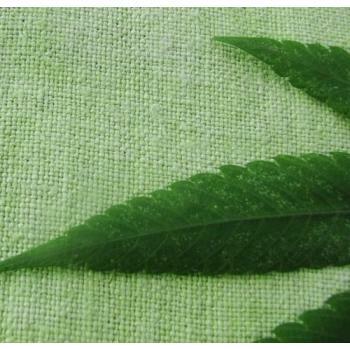 Firstly, cannabis fabric is quite advantageous in production. Having ambushed a field of medium-size with seeds of cannabis sativa you may crop a considerable amount of material after processing. In general, industrial cannabis is largely very advantageous. For example, if you mention production of paper we can say that cannabis plants are about 5-8 times more fruitful than trees. Trees need a few decades to grow enough to become paper and if while the same period you sow the same territory with cannabis you will get the results of yield which are mentioned above. Cannabis fabric is mainly made of industrial strains of cannabis, based on sativa due to its high growth parameters. Due to its growth characteristics, the fibers which are used for the manufacture of fabric go long, greatly facilitating further processing. Cannabis fabric has some very significant advantages for its user. The first one is its great insulation. In the context of suffocating summer heat the fabric will stop the heat whiling to overheat your body. And searing cold of winter, on the contrary, will receive much less of heat, generated by your body, because the fabric "will not release it." Also, due to its outstanding heat transfer characteristics, a person dressed in clothes of cannabis fabric will sweat less, and will not "bloom and smell" within half a day. Having put on such clothes you will always be in dryness and comfort. Another important feature of the fabric of cannabis is incredible strength and stability of forms. No matter how often you wash it or how much you stretch it the shape will not change and it will not look worn. On the contrary, "fresh" cannabis fabric is slightly stiff, but each wash makes it softer and more pleasant. Cannabis clothing has a pretty significant positive impact on the health and mood of its happy owner. Features of this material are really impressive! Nowadays there are more and more of designers and clothing manufacturers who begin to pay attention to the "well-forgotten old" and such a wonderful material comes back into fashion again. It happened so, in part, due to the growing popularity of organic products, and in part due to extraordinary efficiency of the material itself.